The VNPS takes an active role in legislative issues, keeping members informed of important ideas and laws that are being considered by lawmakers in Virginia. We also coordinate with other groups to put forward actions that work toward our goal of conservation. 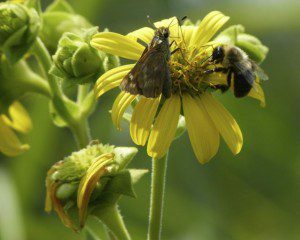 Recently the Pollinator Partnership put out a call for national recognition of a new Pollinator Week. Our Conservation Chair, Marcia Mabee Bell put some excellent thought into how to modify the boilerplate proclamation the Pollinator Partnership put out in order to show the vital connection between pollinators and native plants. This week the Governor was persuaded to put the new Pollinator Week in place using another version, but we think ours is the best, and here it is, with the bolded and the green phrases being our own. throughout the Commonwealth of Virginia, and urge all citizens to recognize this observance.